Here’s the big one! 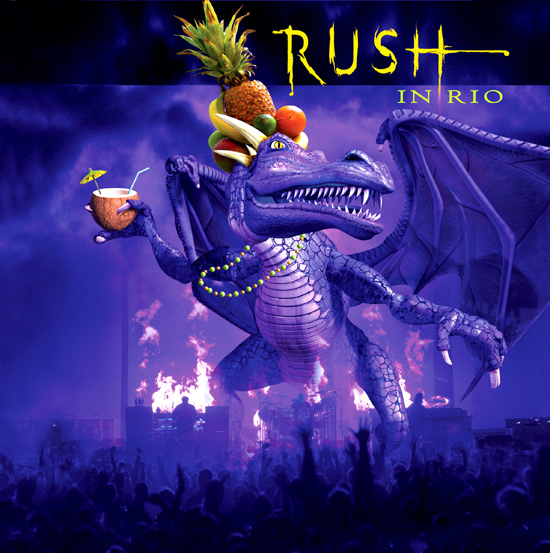 After the success of the Vapor Trails Tour, Rush decided to cap things off by taking up one of the numerous invites their management had received to play three shows in Brazil. Brazil (and South America at large) is noted for having one of the most dedicated and passionate fan-bases for hard rock and heavy metal, particularly progressive bands like Rush. Rush had been making plans to shoot and record footage of the tour to release, but plans fell through for recording one of the US shows. Deciding to film the shows in Brazil, they only ended up recording the last show in Rio on very basic equipment provided by the locals. The band and their crew also wasn’t prepared for the circuitous roads in Brazil, taking eight hours to get to the venue and not talking the stage until 10:30 at night (naturally, a proper soundcheck was out of the question). Rush themselves weren’t even sure what to expect, as rain at the previous two shows (in Porto Alegre and Sao Paulo, respectively) had begun shorting out their equipment. Alex’s pedalboard was on the fritz and there was a 50/50 chance that Neil’s MIDI Marimba (a crucial tool in his drum solos) would work. Things managed to get repaired in time for the show, but the band was clearly preparing for everything to fall apart. Thankfully it didn’t though, and the show went off without a hitch. In my opinion, “Rush In Rio” is the band’s greatest live record. It shows a band triumphant after all the tragedies they’ve experienced the last few years, flying without a net and giving it all they’ve got in front a huge crowd of die-hard, passionate fans. The attendance at the show in Rio would tip the scales at 40,000, the second largest audience the band had ever played to. The largest would be 60,000 in Sao Paulo, the previous evening. From the opening chords of “Tom Sawyer”, your hair stands on end when you hear 40,000 crazy Brazilians singing along with the opening lines and not letting up. This crowd doesn’t just get in one or two big parts: they sing the WHOLE SONG in time with Geddy Lee. Perhaps owing to the primitive recording methods for the show, but the crowd was so loud they literally couldn’t be mixed out. But throughout the show, it’s their passion and energy that drives most of the proceedings. Definite highlights are when they sing along with “YYZ” and “La Villa Strangiato”…a pair of instrumentals. The first set you can really tell the band was running on adrenaline, as they give furious performances of old classics like “Distant Early Warning” and new songs like “Earthshine”. The sing-a-longs during “Bravado” and “Closer To The Heart” (brought out specifically for this show) are all the more heartening when you remember most of the crowd probably can’t speak English, and the chants during “Freewill” and “Natural Science” are a treat. The momentum slows down a bit for me briefly when the second set rolls around, but newer songs like “One Little Victory” and “Secret Touch” bring the house down when performed. “Dreamline” and “Red Sector A” get huge emotional responses when they’re brought out, and the stripped-down acoustic version of “Resist” with just Alex and Geddy after Neil’s drum solo becomes a very tender moment. As I said before, the performance of “La Villa Strangiato” is a huge highlight for me (particularly with Alex’s humorous rants). After “Spirit of Radio”, it’s fun to see the band play bits of “By-Tor” and “Cygnus X-1” before launching into “Working Man” as the final song. The re-worked version they have here is what I consider the definitive version, and it’s a huge treat to hear as a closing song rather than my dreaded “In The Mood”. And the extra soundboard recordings of “Between Sun & Moon” and “Vital Signs” are a fun extra for fans. In short, I can’t recommend “Rush In Rio” enough. As a live record, it is perhaps the band’s crowning achievement. After five years of doubt, it’s beautiful to see Rush come back in style and show everyone else what they’ve been missing.